"Old, fat and ugly" is what Yevgeniya Magurina jokingly calls a group of flight attendants of Russia's flagship airline Aeroflot who she claims have been sidelined in an apparent drive to make the cabin crew younger and more physically attractive. So what is she doing about it? She took SU to court, and a decision is expected this week. A Moscow court is due to rule in Magurina's lawsuit in which she maintains she was taken off the sought-after long-haul international flights because of her looks. The flight attendant's claim, which triggered a wave of support as well as condemnation, has put the spotlight on how women in modern Russia are still often judged by their physical appearance. "Right now there's a policy that a flight attendant has to be sexually attractive," she says. "But our role onboard is different: it's to ensure safety, not to be an object of sexual desire. This is wrong and hurtful." The issue started last summer when the 42-year old went to pick up a new uniform and discovered that Aeroflot no longer stocks any above Russian size 48 (U.S. size 10). Magurina, who says size 48 fits her on the hips but not on the breast, used to order a larger size and get it tailored. The next incident came when all flight attendants were ordered to be weighed and photographed as part of a contest to staff a special business class crew. Several months later, Magurina, who had typically worked as senior attendant, arrived at the Sheremetyevo airport for her flight only to see she was assigned a junior role: "You scan your pass, the names of the crew light up and you see your position. No one has even told me." Magurina, one of Aeroflot's 7,000 cabin crew staff, says about 600 flight attendants, mostly women, have been put on a list that she jokingly calls the "old, fat and ugly" and have been re-assigned for less prestigious flights. In recent years, SU has undertaken to transform itself from a drab post-Soviet airline to something that can rival the world's best airlines on comfort and efficiency. 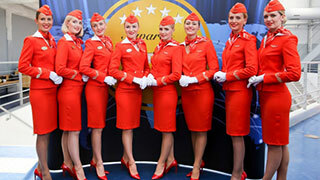 The airline that posted 38.8 billion rubles ($825 million) in net profit last year has recently been rated four out of five stars by the Skytrax consultancy and has entered the world's top 20 airlines by the number of passengers carried. SU has dismissed Magurina's lawsuit as "a routine employee vs. employer dispute that has been deliberately inflated to the scale of a public campaign aimed at tarnishing the airline's reputation," according to Vladimir Alexandrov, the company's deputy CEO for legal matters.